With recording times stretching to over a fortnight, Sony's solid-state voice recorders set new standards. 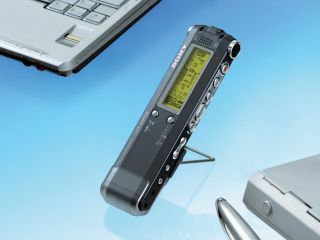 Podcasters are likely to spontaneously combust when they set eyes on the newest digital voice recorders from Sony Japan . Also known as IC recorders, Sony's models use proprietary compression technology for impressive quality, while allowing for extremely long recording times. The newcomers are the JPY25,000 (£106) ICD-SX77, with 1GB of memory onboard, and the JPY20,000 (£84) ICD-SX67, which has half the storage space. As with previous IC recorders from Sony, these will be available outside Japan in a few months, albeit at around double the price. Both machines use Sony's own LPEC codec - an acronym for Long Term Predicted Excitation - allowing the 1GB model to squeeze in up to 375 hours of audio on the lowest setting. Even at top quality, it still manages over 17 hours. And we'll conveniently ignore the fact that the juice in the rechargeable batteries will stretch only to around 24 hours. Thankfully, the recorders can play back MP3 files as well as LPEC audio and software is included for editing LPEC recordings that allows data to be exported in the more universal MP3 format. On the hardware front, the SX67 and 77 use the same three-microphone arrangement we've seen before from Sony to lay down full stereo recordings. A stand with a standard camera screw for attaching to a tripod is included to make it simple to position a recorder next to a musical instrument or performer. Perfect for bootleggers then.